1 in 5 people in the UK are using foodbanks and although we wish this wasn’t the case, foodbanks need our support. 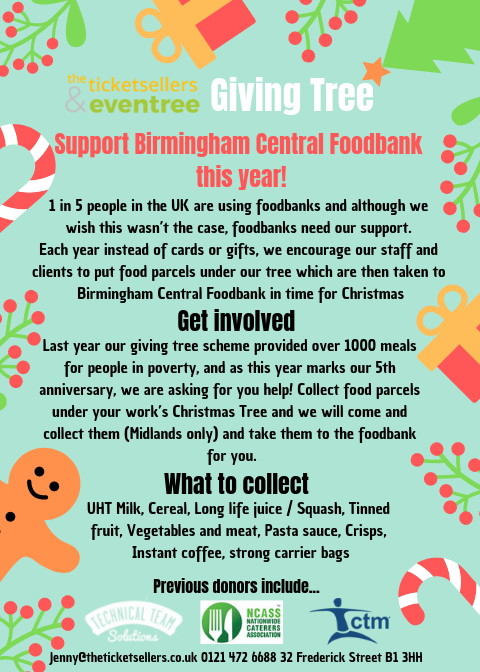 Each year instead of cards or gifts, we encourage our staff and clients to put food parcels under our tree which are then taken to Birmingham Central Foodbank in time for Christmas. Last year our giving tree scheme provided over 1000 meals for people in poverty, and as this year marks our 5th anniversary, we are asking for you help! Collect food parcels under your work’s Christmas tree and we will come and collect them (Midlands only) and take them to the foodbank for you. If you'd like to arrange a collection, contact jenny@theticketsellers.co.uk or call us on 0121 472 6688. UHT Milk, cereal, long life juice / squash, tinned fruit, vegetables and meat, pasta sauce, crisps, instant coffee and strong carrier bags.